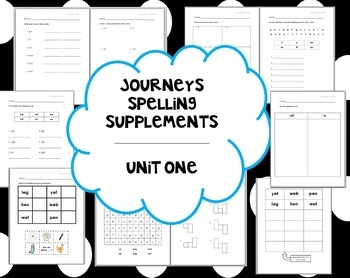 This packet includes spelling worksheets that coincide with the 2013-2014 Journeys reading series. It includes 9 activities for ALL 6 units (lessons 1-30). This is a BUNDLED set of my six separate units. By purchasing this bundle you are receiving a discount! These sheets can be used in stations, made into a packet to complete as an early finisher, homework, morning work, etc. (The preview is for Unit 1 but this listing is for ALL SIX units. The units are essentially the same; just with different lists).